I wasn’t there when it happened, but growing up I was fascinated by accounts of the amazing, astonishing, never-to-be-repeated feat. I poured over pictures, watched videos and even had (still have) a picture book about the events of August 7, 1974. That was the day Philippe Petit stretched a wire across the gap separating the towers of the World Trade Center and walked between them, 110 stories above the ground. He captivated New Yorkers, made headlines around the world and was promptly arrested (charges were later dropped). Today I had the opportunity to hear the high wire artist, magician and culture outlaw tell his mesmerizing story during a program called A Conversation About Bold Imagination. 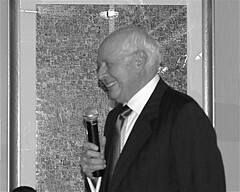 The event, held at the Tribute Center, reunited Petit with Guy Tozzoli, the Port Authority executive who oversaw the creation of the towers. During their first meeting, more than 30 years ago, Tozzoli inadvertently gave Petit the information he needed to sneak into the towers and carry out his illegal, subversive but magnificent feat. 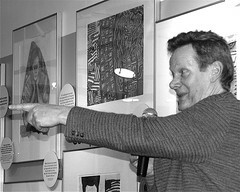 Speaking before a small, rapt audience, the men joyously recounted the visions they both brought to life at the World Trade Center, inspiring their listeners to follow their own dreams. 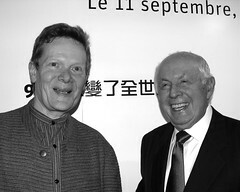 Oh, and Philippe Petit signed my book, The Man Who Walked Between the Towers. Yay! 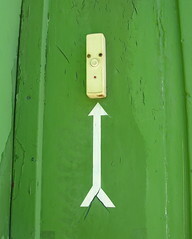 This startled-looking doorbell is mounted on a Van Dyke Street house in the Red Hook section of Brooklyn. 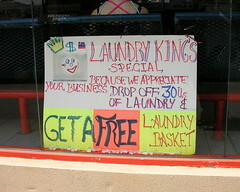 This sign was posted in the window of the Laundry King laundromat on 4th Avenue in Bay Ridge, Brooklyn. You are currently browsing the Blather From Brooklyn blog archives for November, 2007.